The Moms with Apps app is an independent catalog of educational and family friendly apps in Apple's App Store for iOS devices. 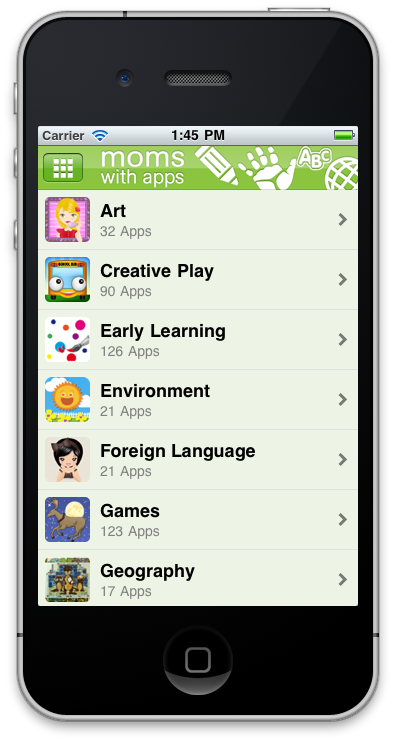 It is the collaborative effort of the Moms with Apps (MWA) developer group to improve the search and discoverability of educational apps. This feat is accomplished by curating and categorizing over 1000 apps from over 300 of the App Store's most applauded educational app developers. 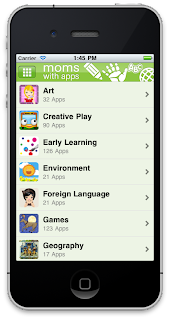 While the App Store bundles all educational apps into a single category, the MWA app provides additional categories such as Art, Creative Play, Early Learning, Foreign Language, Math, Reading, Science, Special Needs, etc. Within these categories app can be further searched by recommended age. The entire concept of redefining and improving the education category of Apple's App Store was a questionable undertaking in its own right. As a group of developers who are all basing their livelihood off of the App Store, there is overwhelming pressure to always stay positive about Apple and its offerings. However, the notable rise in the use of iPhone and iPads for educational purposes, seemed to motivate our cooperative to try and make the Educational App Store an easier place to navigate. It was entirely plausible that Apple would take take offense by the underlying, yet unspoken message: The Educational App Store can be better. Our trepidations were quickly assuaged, as the release of the MWA App was immediately recognized as the #1 app in the educational New & Noteworthy chart in 8 regional App Stores. The app was sprinkled across the top Free downloads charts around the globe and, on some days, we were consistently seeing a few downloads a minute. Being a resident of Canada's loud neighbor to the South and having little insight into their educational system, I do not fully understand the reasons but the Canadians have really embraced Moms with Apps. We were fortunate enough to enjoy a week on the front page of their App Store as a featured app with our own custom artwork. That's us in green...next to the Oscars! App developers who are also parents have a complex and distorted way of looking at the App Store, compared to the typical iPhone toting parent. Once you've seen the behind the scenes, inner workings (as a developer), the magic of the worlds biggest software store disappears and is replaced by bouts of frustation and disillusionment. It's kind of like the Matrix...but without the shiny outfits, guns, and bewildered grunts of Keanu Reeves. The question that we, as educational developers, want to know is, "Are there parents out there that are looking for great educational software, but are just too flustered by the App Store to bother?" I see it myself when I go...pretty much anywhere. Two-year olds playing "Angry Birds", "Cut-the-Rope", or "Plants Vs. Zombies". Granted, every game (especially physics based ones) have some educational value, but is it simply that parents are not as concerned with the apps their toddlers are playing as educational developers think they are. The most telling (and encouraging statistic) that we have observed from the MWA app is the average time per use. Simply, this tells us how long a users is using the app in a single session. In the first month, the MWA app average time per use was 23:59. This is averaged over 135,000 visits from 50,000 users. Quite simply, parents are spending a significant amount of time searching for apps that meets their families needs. They were waiting for a better way to discover apps. 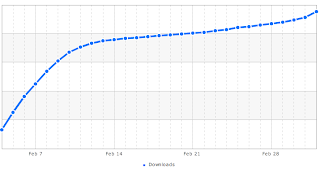 As with any app that has benefited from exposure by Apple, we had a very strong start, but downloads have plateaued (cumulative downloads shown in blue). 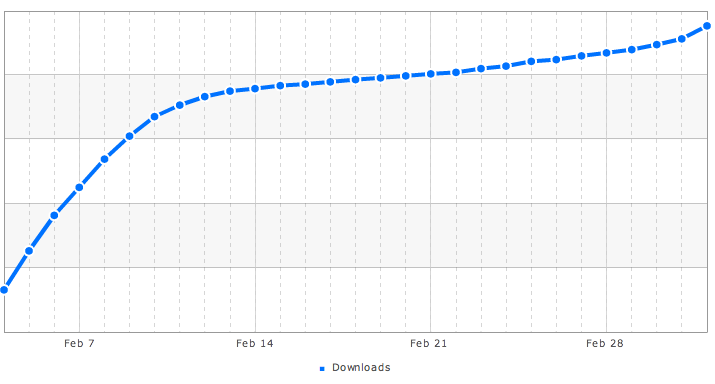 This is not discouraging, as on any given day we see anywhere from 200-500 downloads per day. Within the app, users spent 45% of their time searching through apps, 30% of their time looking through Books, 20% of their time looking through our "Apple Picks" sections, and 5% spread out among other app features (e.g. New Releases, Viewing History, Developers, etc.). 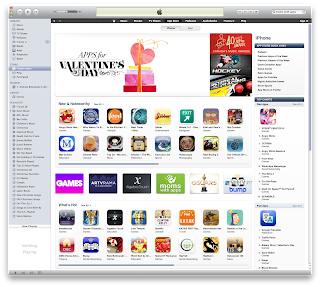 Apple picks is a historical listing of the apps featured by Apple. During the first month, each user viewed, on average, 22 apps per session. This correlates well with the average session time of 24 minutes per session: parents are taking time to actually read the app descriptions. For developers, this means that the hours of analyzing each word in an app description were not lost. It is actually a very important part of marketing your app. I, for one, found this surprising, as an informal survey of non-developer iPhone owners indicated that purchasing decisions were based on recommendations from friends and screenshots. When asked if they read the descriptions, I received a unanimous "No". Unfortunately, the layout of iTunes actually encourages this impulsive purchasing by requiring you to click to read the entire description, so it is not surprising that iOS users have begun to devalue the app description. My Very First App by Night & Day Studio, Inc.
Rapunzel Classic Story HD by Kwiq Apps, Inc. When the MWA App was designed, the debate between "What's an App and what's a book?" had not really taken hold. Now it is front and center and a major concern for the book-style app developers in MWA and across the entire app ecosystem. 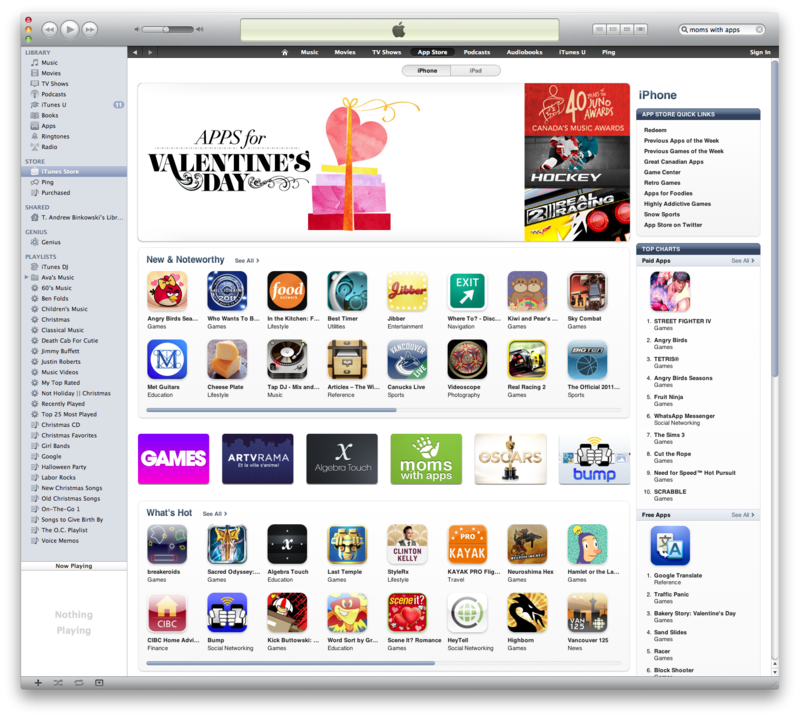 Tales of rejections and suggestions by Apple to release book-apps through iBooks are starting to become more prevalent. Unfortunately, this segregation was not as clear to myself and, as such, didn't amply separate out statistics for Books vs. Apps. However, the app has been updated to monitor this and the next Report Card will be able to shed more light on the subject. The one main pattern to take away is that 98% of the Book views all originated from "View By Release Date". It appears that users are treating the virtual bookstore, much like the traditional brick-and-mortar bookstore, and starting at the new releases. It should be no secret that the MWA app, in addition to its altruistic goals, is designed to be a marketing tool for educational app developers. The MWA developers have invested their time and efforts to curate and annotate their apps, in the hopes of making it easier for parents to find their apps and converting them to happy, paying customers. It's a win-win scenario, parents find the apps they're looking for, developers get customers who appreciate their apps (and aren't scoffing at a $0.99 price tag). In the MWA app, the user has the option to view the app they're looking at in the App Store. This has the advantage of letting the users read reviews and, potentially, purchase the app. During the first month, 16% of the apps viewed resulted in a tap-through to the App Store. This is not purchases but simply getting to the App Store. Once in the App Store, the users may see unfavorable reviews and elect not to purchase, among other scenarios. Without anything comparable to analyze this rate against, it is difficult to draw many conclusions. If you consider the MWA app as simply an advertisement tool, than the number is huge compared to the sub 1% click-through-rate seen in in-app ads (at least in my apps). If you think of it as a store front, than we would need more cooperation from Apple to compare it (but I'm not going to hold my breath). It falls somewhere in-between and so there are more questions than answers at this point. At the end of the day, we can say that we are helping parents find apps to better fit their needs and helping to direct them to the App Store for more information. The feedback from users has been great. For once, I 'm proud to point people to my App Store reviews for a Free app. Parents are just as excited about the role of iOS devices in education as are the developers who are working on them. However, they have been very clear that they want more from the MWA App. We have been listening and working hard to implement them. In the next major release (coming soon), we will be introducing "Page 2", a second page in the MWA App. Page 2 will contain exclusive content from leading researchers, educators, technologists, bloggers and industry professionals all providing insights on apps, books, and parenting the 'iOS generation'. We hope that the addition of Page 2 will continue to forward the mission of MWA to advocate healthy intersections of kids and family life with technology. The Moms with Apps app is available as a free download in Apple's App Store . BabyBinks develops iPhone applications for modern families. Come on and join the party; there's stroller parking in the back, a changing table in the bathroom, and cold beer behind the breast milk in the fridge. To pay for diapers, BabyBinks develops iPhone applications for modern families. Moms with Apps Presents "App Discovery Week"
Copyright © 2005-2012 BabyBinks.. Simple theme. Powered by Blogger.